Backpacking Background: I have been camping and hiking for as long as I can remember, but I've really only been backpacking for eight years or so. I started off in the hills of northeastern and central Pennsylvania, have hiked trails from Maine to Georgia, and now I am exploring the incredible terrain of the inland northwest. I seldom do trips longer than three days, with most trips being overnighters. I do not own crampons, an ice axe, or a climbing harness, so if the route is technical enough to require them, you won't find me there. I simply like to walk in the woods. Other details: I was a bit disappointed that the listed weight on the website - 9.2 oz (259 g) - differed from the listed weight on the packaging -10.2 oz ( 289 g). The weight on the packaging accurately reflects the measured weight, but for those ordering online, like myself, it is an issue. Two things struck me as soon as I took it out of the box it was shipped in. One, it's small. It comes in a small stuff sack of its own and measures only 6 x 6 x 3 inches (15 x 15 x 8 cm). 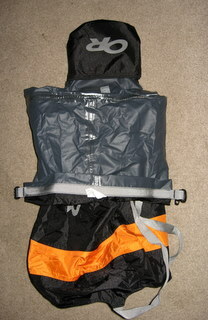 This sack is black nylon with a gray OR (Outdoor Research) logo on one side and a small gray loop of webbing as an attachment point. Two, it's heavy. It is definitely not your typical stuff sack. The AirX sack has some heft to it. 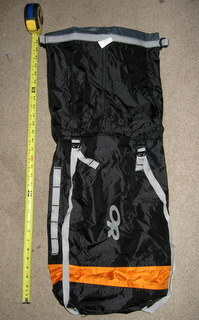 Even comparing it to just OR's product line, this is the heavier than any of their other dry bags or compression sacks. It will have to really perform to be worth this extra weight on my back. Opening the bag revealed an interesting surprise. The stuff sack that the AirX sack comes in is not really a separate bag; it is attached to the inside of the AirX sack. This is displayed in the picture to the right. The stuff sack is attached about halfway down the inside of the AirX sack This is a perplexing design choice. Perhaps my testing will reveal the logic behind this decision. As the name suggests, the idea is to combine the functions of a compression sack and a dry bag into one product. The opening of the sack rolls up and buckles closed exactly like a typical dry sack would, and there are four compression straps running the length of the sack. The daisy chain on the side and the webbing on the bottom are nice details that should allow for easy attachment to the outside of a pack or kayak. The color option I chose was black with a gray OR logo and an orange stripe near the bottom. All of the webbing is gray as well. All of the seams are taped and all of the measurements aside from the weight match what was specified on the website for the size I ordered. The instructions are concise and printed on the packaging. They sound simple enough, but wait, this doesn't seem to make sense. The directions state: "Loosen straps and stuff gear in sack. Use straps to compress load." Don't I need to close the bag before I compress it? Reading the rest of the directions does not clear this up: "Purge air by pressing down on top closure. Ripstop nylon fabric band purges remaining air. Find the dark grey coated fabric at the opening. Match the edges and fold them over the light grey nylon webbing. Roll top three times and fasten buckle." Reading these instruction and then looking at the sack makes me think that this is not going to be easy to figure out. Where is that "fabric band"? It must be the orange stripe near the bottom of the sack. But I still don't understand how the first two statements of the instructions can possibly be correct, but I get out my sleeping bag and give it a go. I stuff my sleeping bag in the AirX sack and pull on the compression straps as the instructions say. Lo and behold, my sleeping bag pops out of the top because it is not closed. You can see my blue sleeping bag peeking out of the top in the picture to the right. Am I crazy, or is actually closing the bag the very last thing the instructions say to do? So I struggled with this thing for quite some time before I figured it out. I even went so far as to email OR's customer service. They were prompt to respond, replying first thing Monday morning to a message sent after business hours on Friday. But the customer service rep merely confirmed what I had already figured out by then: ignore the instructions. Here's what to do. Stuff your gear in. Roll up the top and buckle it. Then, holding the roll so it doesn't come undone, apply gentle but even pressure to compress the contents and force all of the air out of the "fabric band," which is an air-permeable waterproof band that will allow air to escape as one compresses the sack. A few caveats: don't push down too hard or quickly, and keep hold of the roll. This is why I struggled to figure out the AirX sack. The fabric band does indeed do what it claims, but if I tried to compress my stuff too quickly, it felt like the AirX sack would burst like a bubble. I would point out here that this bag has not failed in any way and the seams and fabric never ruptured or split. But air pressure does build up in there if it is compressed too quickly, to the point where I was worried about a possible rupture. Also, if I did not keep a hand on the rolled-and-buckled opening, the air pressure would cause it to unroll, compromising the water-tight seal. The best I am able to do is compress my sleeping bag down to 12 x 9 inches (30 x 23 cm), down from the 17 x 9 inches (43 x 23 cm) of the stuff sack it came with. 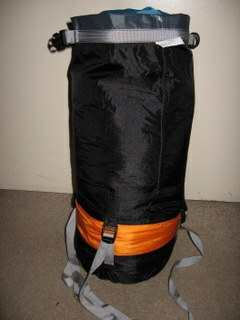 The sleeping bag is a Sierra Designs Wild Bill +20 F (-7 C) synthetic bag. The big difference here is that the stuff sack weighs 2.1 oz (60 g) compared to the AirX sack's 10.2 oz ( 289 g). This is a big tradeoff in my opinion. I'm not sure it's a tradeoff that I'm happy to make, but further experimentation is in order before that judgment is made. I will test this sack more at home before taking it into the field. First, I will further explore its ability as a compression sack. I have a few sleeping bags . . . will each one fit into the sack? How significant is the space saved by using the AirX sack over the stuff sack that the bag came with? My tent (REI Half-Dome) came with a very inconveniently shaped stuff sack (like a fat cigar), so I am curious as to how this sack will handle it. Will it save space? Will it compress the tent into a more manageable shape? I will also see how well it handles clothes. 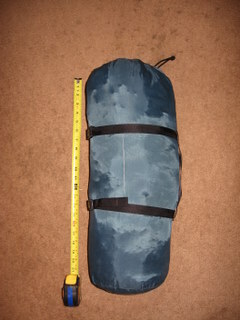 Is the size of the sack appropriate for the clothes I take on a typical backpacking trip? Does the sack compress them well enough to justify the extra weight? Some other issues related to its functionality as a compression sack that will be evaluated will be: are the buckles, straps, and fabrics strong enough to handle being stressed, stuffed, and over-stuffed? Is the fabric going to handle brushing up against sticks, stones, and random objects inside my pack? Does my fully loaded backpack have extra space and feel stable when the AirX sacks are used in packing? Next, and perhaps most importantly, is testing the waterproof capabilities of the AirX sack. My bathtub will be the setting for some of these tests. I will float it in a full bathtub to simulate being dropped in a stream or lake. Does it float? I'll take it out immediately and examine the inside. Did it keep the water out when quickly dunked and then pulled out? Back in the water. Let it soak. Examine it again. Back in the water to soak longer. Examine it again. I will let it soak and examine it periodically while keeping notes on time and conditions so I can see if there is a certain time limit that it remains dry for. Next the shower. I'll turn on the shower and let the AirX sack get pelted from above with water, simulating a downpour to see how it handles moving/falling water. Again, I'll time it and frequently examine the contents to see if the length of exposure to water makes a difference. Finally, I'll be taking this into the field with me into the temperate rainforests of Olympic National Park. This will be a great opportunity to test the waterproofing on the AirX sacks. The rain, mist, and fog in the rainforest are infamous for penetrating everything, regardless of the fancy man-made fabric or "water-repellent" coating. If it holds up here, I'll know it will hold up anywhere. There is certainly a discouraging learning curve on this thing. It's not a good sign when I have to contact customer service to figure out how to use a bag. The poor instructions exasperated the situation. That was frustrating and not something I bargained for in a sack. I have some homework to do before I feel comfortable including this thing in my pack when I'm heading into the backcountry. This concludes my Initial Report. The Field Report will be amended to this report in approximately two months from the date of this report. Please check back then for further information. Thanks to Backpack Gear Test and Outdoor Research for the opportunity to participate in this test. The first real trial that this drysack experienced was a controlled soaking in my bathtub. I stuffed it full of cotton clothing so I would be able to detect any leaks quickly and easily. I filled the tub, floated the AirX sack in the water, and waited one minute. I took the clothes out very carefully and checked them. No leaks. Re-stuffed the bag and repeated. This time I waited five minutes. Still no leaks. I let it soak for thirty minutes. Still dry. So then I turned on the shower and let the sack get pelted from above for a few minutes. No matter what I did, the AirX sack kept everything inside completely dry. As an additional step, I took the AirX sack with me on a fishing excursion on the Spokane River. I really had no use for it on this particular trip; I only brought it along to further test its waterproof capabilities. So as I fished on this beautiful autumn day, the full sack was floating in a small, swirling eddy carved out of the basalt shoreline. After about an hour of that, the inside remained dry and the outside showed no visible signs of wear. In preparing for my trip, it was interesting to see exactly how this piece of gear fit in with my usual mode of travel. I pack light, but certainly not ultralight: my three-day pack weighs in at about 30 pounds (14 kg). I debated whether to stuff the AirX sack with clothes, my sleeping bag, or my tent. The sack could fit two out of the three, but then the shape and size becomes an issue. It becomes too unwieldy to fit comfortably in my 3300 cu. in. (54 L) pack. I decided on the tent. To the right, you can see how my tent looks when in the stuff sack that came with it. This is an REI Half-Dome. Pretty long and bulky as is. I rarely take the stuff sack, opting instead to just shove it in my pack wherever there is space to fill. I could not fit the poles in the AirX sack, but it did a nice job of compressing the tent, footprint, stakes, and rainfly into a more spherical shape, as opposed to the inconvenient cylinder of the tent's stuffsack. 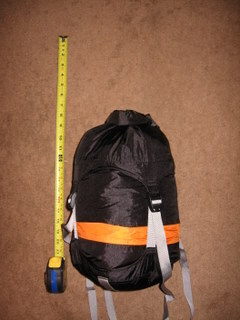 The AirX sack got it down to 13.5 X 8.5 in (34 X 22 cm), down from 20.5 X 7.5 in (52 X 19). Finally, a chance to put this thing to the test in the field. On September 15th, I headed out to the Hoh River rainforest valley in Olympic National Park for a three-day backpacking trip covering approximately 15 miles (24 km) and 400 feet (122 m) of elevation gain. The temperatures ranged from a high of 68 F (20 C) to lows of about 42 F (6 C). serendipitously, I discovered a great use for the AirX sack: a waterproof food bag. I had hung my food from a tree using the only bag I had on me: the AirX bag. All through the night it rained steadily. It stopped by the time I crawled out of the tent in the morning, but water was everywhere. The morning chill seemed the worse for the all the moisture in the air. But when I retrieved my food bag, the AirX sack had protected everything just fine after a night of exposure to a rainforest downpour. The second day was dayhiking day. I strapped the AirX sack full of clothing onto the outside of my pack in order to test its ability to withstand abrasion. Even though the rain had stopped, every time I touched any vegetation, I got soaked. To make matters worse, I was leaving the trail frequently and bushwhacking down to the river. This sack was getting soaked from brushing up against spruce and cedar trees full of water. But it never failed. A few days later, after leaving Olympic National Park, I camped at Cape Disappointment, at the mouth of the Columbia River. That night a storm rolled in off of the Pacific. This time, I stuffed the AirX sack full of clothes and hung it from a tree. Again exposed to torrential rains all night, everything inside remained dry. The Hydroseal DryComp AirX sack performs exactly as promised. After some initial confusion as to how best load and compress it, the AirX sack proved to be fairly easy to use and incredibly reliable as a waterproof barrier. As stated in my Initial Report, the AirX sack is rather heavy when compared with other stuff sacks, but this is probably the reason why it has proved so resistant to abrasion and steadfastly waterproof. Once we get some snow on the ground, I'll take this thing snowshoeing to see how it does in low temperatures. The AirX sack is probably not going to be used in this situation very often, but since I'll be going anyway, I'll take it along and see what happens. Strange thing, testing this in the winter. I sure don't do any winter paddling (not that it's even possible around here), so my long-term experience with the AirX sack has been on dayhikes and snowshoeing excursions. Many of those outings have been along the Spokane River, anywhere from 1600 - 1800 ft (490 - 550 m) in elevation and generally cold and snowy, with temperatures varying from 15 to 38 degrees F (-10 to 4 C). Though there was always snow on the ground, I got by with just hiking boots, since these trails are well traveled and compacted. These were short and quick hikes, 2 - 5 miles (3.2 - 8 km) in length. Two times I've taken the AirX sack on snowshoeing trips to Mt. Spokane. These were longer hikes, anywhere from 4 - 7 miles (6.4 - 11.2 km) in length at elevations ranging from 4600 - 5200 ft (1400 - 1580 m). The temperature was fluctuating near 28 degrees F (-2 C) on both trips. Snowshoes were required right from the trailhead, as we've had a very snowy winter this year, and the powder on the mountain has been dry and deep. My long-term experience has done nothing to change my opinion of it from my previous reports. This thing is built to last, and performs exactly as it should. It has proven to be 100% waterproof in every situation, it compresses gear well, and it seems to be pretty abrasion resistant, as it still looks brand new despite a few months of regular use. On these snowbound dayhikes, I had various things packed in the AirX sack, from extra layers and a hard shell to my sleeping bag and pillow. During breaks, I would pull out the stuffed sack and use it as a seat in the snow, confident that the contents were protected. And when my non-waterproof daypack got soaked, the AirX kept everything within it dry. Here's the only drawback to this product, and this may be more a function of my particular recreational habits than of the product itself: I have little use for it. For paddlers who do multi-day trips, this double-function bag will save precious space and weight. For those who camp/backpack in perpetually wet conditions, like those encountered on my Olympic coast trip, the AirX sack may be of value. But personally, I am generally a three-season backpacker, and the weight of this product will make me leave it at home in all but the most dire weather conditions. And really, if the forecast is that bad, I usually stay home. It is a quality product that delivers on its promises. But it is a very specialized product that is suited to very specific situations. I will use the AirX sack on the handful of paddling trips I do each year, but I will not be using it on my many backpacking trips. The weight is just too much of an issue for me. My other waterproof gear (tent, shell, pack cover) will keep me and my stuff dry. Many thanks to Outdoor Research and BackpackGearTest.org for the opportunity to participate in this test.